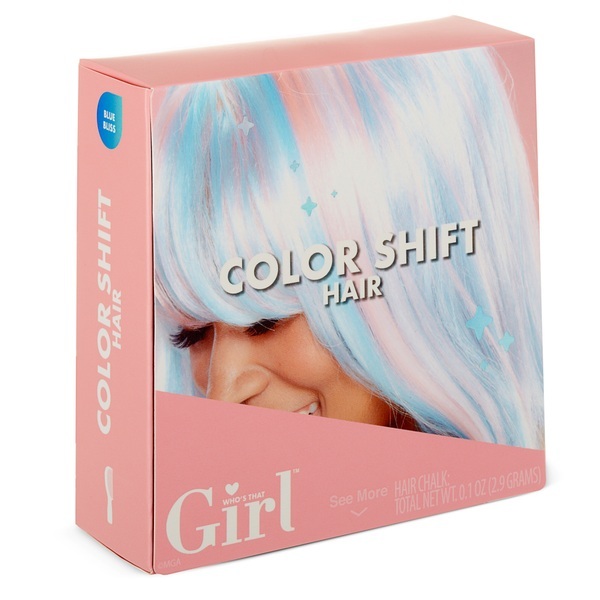 Stand out from the crowd with this vibrant hair chalk that changes colour! Goes on as one colour, then changes when you warm it with your hands, and again when you step out into the sun! Mix and match colours to update your style on the daily! Who's That Girl™ is the beauty brand made just for you. Now you can follow the hottest trends and create fun looks just like your favourite beauty stars with the Who's That Girl™ cosmetics! From glitter nails to colour streak hair to mood lips and more, Who's That Girl™ allows you to create beauty looks that express your personality. Mix and match all our products to create a head-turning style all your own, making everyone around you want to know – who's that girl? Stand out from the crowd with this hair chalk that changes colour! Colour streak Hair is a special hair chalk that not only colours your hair, it changes colour with the heat of your hands again and again. See your hair magically streak from one stunning colour to another. Then step out into the sun to watch it change to a different vibrant shade.